This clock was passed down to me by my father. 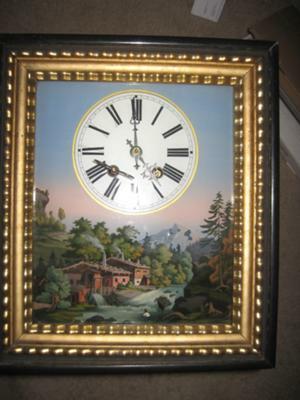 As the story goes, his Grandfather (my Great Grandfather), Frank Lindner, made this clock for his wife, Ida Lindner. Frank and Ida emmigrated to the United States from Germany around 1914 and settled in Washington, DC. The glass panel broke a long time ago and I've been unable to find a piece that is thin enough to fit in the frame. I've include a frontal pics and can provide inside pics if necessary...figure this is one of a kind, but can somebody out there tell me something about it?